This fall, Prairie’s Upper School students will present “Dead Man Walking” a change from the original scheduled production of “The Trojan Women.” The play will challenge students to undertake serious roles as well as allow them to discuss the various aspects of the death penalty and what it means to each of them. 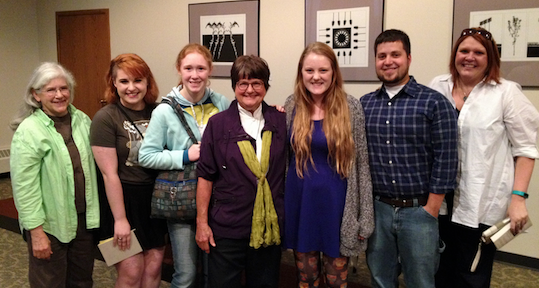 In order to create a stronger connection with the story and characters, cast members from this year’s fall play, were given the opportunity to meet Sister Helen Prejean at Carroll University. Her New York Times Best-Selling book “Dead Man Walking: An Eyewitness Account of the Death Penalty in the United States” is a biographical account of her relationship with inmates on death row. After Sister Helen’s presentation, she spent time with students and even provided them with advice for playing their roles. The discussion of the death penalty will also occur off the stage. The Performing Arts Department is in the process of engaging alumni and community speakers for a panel discussion as well as talking with Upper School faculty regarding curricular tie-ins linked to a national project focused on the play. We look forward to this year’s production that will run November 13-15 at 7:30 p.m. To purchase tickets in advance, click here. This entry was posted in All News, Featured, Performing Arts, Upper School by Communications Department. Bookmark the permalink.